A new way to help make trash disappear? The world’s oceans are filled with plastic. More than 5 million pieces of it are floating around, being eaten by fish and passed up the food chain. Every year, more than 100,000 marine animals and seabirds are killed by plastic waste. Illustration: P. Huey. Sourced from U.T. Bornscheuer, Science 351:1154 (2016). Of the 342 million tons of plastic produced each year, a tiny fraction of it – about 14% – is recyclable. That’s a lot of plastic, and it hasn’t even been around that long. If you’re older than 70, you’ve been around longer than plastic. The bacterium, Ideonella sakaiensis, was found outside of a bottle recycling plant. The pathogen appears to have evolved a pair of enzymes it uses to break down PET. The bacterium can almost completely break down a thin film of PET after 6 weeks at a temperature of 86 degrees Fahrenheit. According to the researchers, appendages from the cells might have secreted compounds that helped to dissolve the plastic. 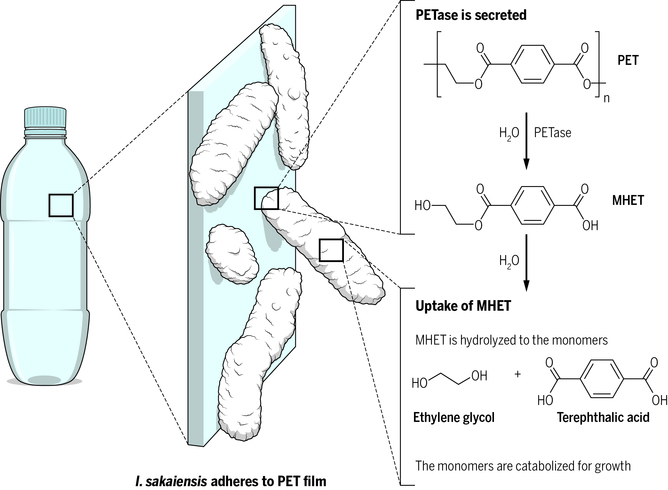 But the bacterium is still struggling to break down PET, so it’s going to take more time and research before scientists can harness the power of Ideonella sakaiensis and use it to truly recycle plastics. Don’t start tossing stuff out of your car window just yet. There’s also an important obstacle that needs to be overcome first. Despite plastic being relatively “young,” the researchers said the fact that one organism has already evolved the ability to consume it suggests that other microbes exist that can eat PET and other kinds of plastic, which could revolutionize the way we recycle waste. You called this bacterium a pathogen. Is this correct? Can it cause illness?